Incineration is a thermal waste treatment process involving combustion of organics in waste materials. 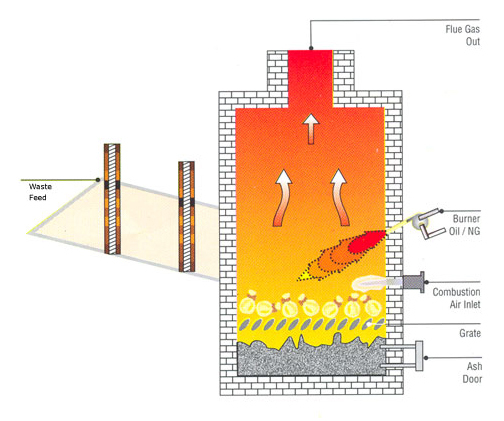 Incineration of waste materials converts the waste into ash, flue gas, and heat. The ash is mostly formed by the inorganic constituents of the waste, and may take the form of solid cakes or suspended particulates matter carried by the flue gas. The flue gases must be filtered/cleaned of gaseous and particulate pollutants before they are discharged into the atmosphere. In some cases, the heat generated by incineration is also used to generate electric power. Incinerators reduce the solid mass of the original waste by 80–85% and the volume (already compressed in garbage trucks to certain extent) by 95-96 %, depending on composition and degree of recovery of materials such as metals from the ash for recycling. This means that while incineration does not completely replace landfilling, it significantly reduces the necessary volume for disposal. Garbage trucks often reduce the volume of waste in a built-in compressor before delivery to the incinerator. In many countries, simpler waste compaction is a common practice for compaction at landfills. Incineration has many advantages for the treatment of certain waste types in niche areas such as clinical wastes and certain hazardous wastes where pathogens and toxins can only be destroyed by high temperatures. Some examples are chemical multi-product plants with diverse toxic or very toxic wastewater streams or clinical waste, which cannot be routed to a conventional wastewater treatment. Waste combustion is particularly popular in countries where land is a scarce resource. Denmark and Sweden have been leaders in using the energy generated from incineration for more than a century, in localised combined heat and power facilities supporting district heating schemes. A number of other European countries rely heavily on incineration for handling municipal waste, in particular Luxembourg, the Netherlands, Germany and France. Incineration is the process of burning solid, liquid, or gaseous combustible waste at specified rates. When operated efficiently in a properly designed incinerator, the result should be a pollutant free emission of products of combustion i.e. gases from the chimney, and a residue / sterile ash containing little or no combustible material remains on the hearth. Type ‘O’ waste is defined as Trash, mixture of highly combustible waste such as paper, cardboard, cartons, wooden boxes and combustible floor sweepings, from commercial and industrial activities. The mixture contains up to 10% by weight of plastic bags, coated paper, laminated paper, treated corrugated cardboard, oily rags, and plastic or rubber scraps. This type of waste contains 10% moisture, 5% incombustible solids and has a heating value of about 4750 Kcal/kg as fired. Type ‘I’ waste is defined as Rubbish, a mixture of combustible waste such as paper, cardboard cartons, wooden scrap, foliage and combustible floor, and sweepings from domestic, commercial and industrial activities. The mixture contains up to 20% by weight of restaurant or cafeteria waste but contains little or no treated papers plastic or rubber waste. This type of waste contains 25% moisture, 10% incombustible solids and has a heating value of about 3600 Kcal/kg as fired. residential occupancy, consisting of up to 50% moisture, 7% incombustible solids and has a heating value of 2390 Kcal/kg as fired. has a heating value of 1390 Kcal/kg as fired. Human and animal remains, consisting of carcasses organs and solid organic waste hospitals, laboratories, animal pounds and similar sources consisting of up to 85% moisture, 5% incombustible solids and having a heating value of 555 Kcal/kg as fired. percentage will vary according to the type of waste burnt. produce relatively high gas velocities in this area and thereby provide intimate mixing between combustion products and the excess combustion air. The excess air is introduced at port on duct between primary and secondary chamber. The gasses are then completely burnt in the secondary combustion chamber and are converted to CO2 and H2O. Under high temperature, excess air and adequate retention time complete combustion is ensured. Relatively high voltage, high current electricity is passed between two electrodes, spaced apart, creating an electrical arc. Inert gas under pressure is passed through the arc into a sealed container of waste material, reaching temperatures as high as 25,000 °F (13,900 °C) in the arc column. The temperature a few feet from the torch can be as high as 5000–8000 °F (2760–4427 °C).At these temperatures, most types of waste are broken into basic elemental components in a gaseous form, and complex molecules are separated into individual atoms. The reactor operates at a slightly negative pressure, meaning that the feed system is complemented by a gaseous removal system, and later a solid removal system. Depending on the input waste (plastics tend to be high in hydrogen and carbon), gas from the plasma containment can be removed as syngas, and may be refined into various fuels at a later stage or fired on site to provide power. Syngas is produced exclusively from organic materials with a conversion rate of greater than 95 % using plasma gasification. Other inorganic materials in the waste stream that are not broken down but only go through a phase change (solid to liquid) add to the volume of slag with minimal energy recovery and increased cost for refining. For efficient operation of the plant, a portion of the syngas may be used to run on site turbines to power the plasma torches and feed system. Though in several countries, there are still concerns from experts and local communities about the environmental impact of incinerators, Incineration is a key process in the treatment of hazardous wastes and clinical wastes. It is often imperative that medical waste be subjected to the high temperatures of incineration to destroy pathogens and toxic contamination it contains.